Worldwide, there are a vast array of agricultural pesticides and chemicals used to eliminate pests and to protect health, food, and fiber. The safe handling, usage, and disposal of these chemicals and pesticides is of vital importance. The Agrochemical and Pesticides Safety Handbook serves as a field resource on the hazards of these pesticides and chemicals. Providing information on more than 500 pesticides and 100 agricultural chemicals, this informative handbook guides the reader in selecting proper respiratory protection, chemical protective clothing, and storage methods. The text also instructs users on proper response procedures for fires, spills, and other incidents involving these chemicals. 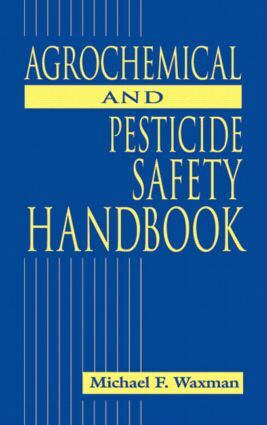 "…a handbook full of highly useful information written in an easily understandable manner…useful safety, handling and emergency information…useful to anyone who handles or uses pesticides or agrochemicals…also useful resource in academic or public library collections."